Since coming back from break, MAoS has basically been the initial uphill incline on a roller coaster. We’re getting time to survey what’s going on around us. The end of "One of Us" is basically cresting the apex before the fall. And we’re back folks. After a week off enjoying some real-life fun in the sun, I’m here to talk about all the wacky hijinks “One of Us” brought us. This week had a bit of something for everyone: Kidnapping, deception, psychotherapy, a RV filled with miscreants. It was paced pretty quickly and at one point I was surprised that we were already 3/4 of the way done with the episode. There weren’t a lot of overarching themes this episode, as the second half of this season has gotten away from the tradition of the first half in that the title presented or at least alluded to a central theme. Instead we’re just watching the pieces get put into place, a blind teleporter here, a scared girl there, a RV filled with miscreants somewhere in Wisconsin (can ya tell I liked the RV filled with miscreants?). We’re definitely building to something. Granted, I’m still not exactly sure what, but it’s definitely something. Cal went from leading a small contingent of super-villains to being summoned by whomever is pulling the Inhumans’ strings. Hunter is extracted with Mack to go meet the ‘real’ SHIELD, whatever that means. Skye is literally breaking herself apart from the inside out. It’s needless to say doing a good job – ok keeping the ball rolling as we got some answers tonight – but we got plenty of new questions to ask once those old ones were put to bed. I’m fairly certain all Hell will break loose next week, or at the very least, some Heck will seep out. Right now I’m enjoying the fact that after the first half of the season’s predictable outcome (not to say that the first half of the season wasn’t awesome, because it was) I’m really not 100% sure how this is all going to play out between now and the end of the season. It won’t stop us from speculating wildly but hey that’s half the fun sometimes. The Index: I’m calling it now The Index is going to factor heavily into the next two years of the Marvel Universe. To be fair they really aren’t being subtle about it. Gemma’s conversation about Skye’s classification with Coulson at the end of the episode sets up the battle over what to do with Skye and more so the rest of the Inhumans once they are exposed by the end of this season. Most likely Hulk’s rampage in Avengers 2 and that Quicksilver and Scarlet Witch will start off as bad guys in the same movie will push the issue from a SHIELD directive to a governmental mandate as the Index becomes the National Metahuman Index or whatever fancy acronym they bust out for it at the end of Age of Ultron. From there who knows, season three could be the team splintering, picking sides on the issues as it snowballs into some sort of war for Captain America 3: Some Sort of War. Angar the Screamer: Angar was a lost gem of 1970’s Marvel. He was a screaming hippie. Sure he could create hallucinations and ruin you with those screams, but again, he was a screaming hippie. Tonight they dusted off Angar for the cinematic universe in a more, how shall we say, updated form. Instead of the hallucinations, we opt for a guy who can unhinge his jaw and knock everything in 50 yards unconscious (admit it you had the same ‘holy crap’ moment I did when all the birds dropped out of the sky). Also I like the small detail that the guy who’s been locked in a basement for however long and eating through a straw doesn’t have pearly white teeth. Marvel has had some good luck with rebooting odd 1970’s characters as of late, there was a little movie featuring a talking raccoon that did fairly well over the past summer, I’d like to see more quasi-forgotten D-list villains (or heroes for that matter) work their way onto this show. 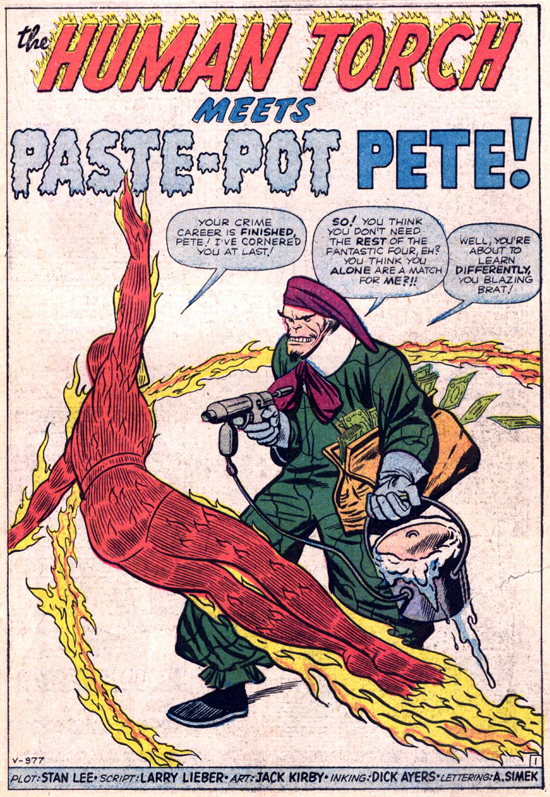 Paste Pot Pete anyone? Cal’s Loki Moment: Loki is probably the best villains in all of the Marvel Cinematic Universe. Sure, it helps that he’s been at the forefront of three movies, but that’s not the point here. Loki is a great villain because when he talks you have that brief moment (or at least I do) where you kind of agree with him. Cal’s big gripe beyond Coulson stealing his revenge is the way SHIELD treats people on The Index and he’s right-ish. A Damn Fine Cup of Coffee: Call it nostalgia but watching Kyle McLaughlin drinking coffee in a diner just made me smile. Sure, I don’t remember him getting angry enough to crush a mug with his bare hands in Twin Peaks but it’s as close as we’ve gotten to Agent Cooper in decades and I’ll take it. Back Story: This week gave us some little snippets into the lives of two of our band of rag tag misfits Director Coulson and Agent May. Coulson has been with us since the MCU began and other than the fact that he has excellent taste in women, we know very little about the man, the myth, the Phil. This week we get two little breadcrumbs dropped on our path, first that he’s from Middle of Nowhere, Wisconsin and that his father, a local school teacher, passed when he was nine. It’s not much to be fair and kind of pales in comparison to May having to go hire her ex-husband, but little bits like this flesh out those two characters nicely. I don’t need to know everything about Phil or May but seeing them talk and act like normal people brings another level to the show’s dynamic. Now, while everyone was going gaga over that fact they kept sneaking in references to May’s work in Bahrain. I expect sooner than later the actual story of how May got the “Cavalry” nickname will come to the surface. Possibly as part of her trying to train Skye to control her powers. Who’s Running the Show: Cal gets zapped away this week to wherever Blind Guy, Raina and now mystery boss are hiding out. The six million dollar question is, “who’s running the show?”. Could we see Maximus this early? I’m about 50/50 on that idea. On the one hand, you could introduce Maximus the Mad independent of Black Bolt and that would free up The Inhumans movie from going the Thor route – aka another brother vs. brother conflict. Max is a bit of a mad scientist himself, so, with him we could see the “formula” Cal constantly talks about tinkering with finalized and we could actually see Mister Hyde. This could free up the Inhumans movie to go interstellar and build Thanos as the Universe’s ultimate big bad. It’s a lot of “ifs” and “maybes” on a fairly long timeline, but that’s half the fun of looking at a connected universe: looking at what pieces could fit where. Either way this speculation will most likely be resolved next week. Razor Fingers: I find it hard to believe the solution to a woman who bolted exacto blades to her fingers is to build these elaborate harnesses that she can’t take off to keep the blades contained. Wouldn’t the easier solution have been, oh I dunno, to remove the blades? You’re a multi-billion dollar clandestine organization and you can’t find a flathead screwdriver to fix some back alley surgery? Not to mention your ‘fix’ for a woman who has killed multiple people with her fingers is to just lock up her fingers and leave her out in public? Because her killer instinct is entirely inhibited by finger splints? It’s roughly equivalent to the parents on Elm Street taking away Freddy’s glove and making him promise never to do it again. Since coming back from break, MAoS has basically been the initial uphill incline on a roller coaster. We’re getting time to survey what’s going on around us. The end of “One of Us” is basically cresting the apex before the fall. Stay tuned next week as I mark out all over Edward James Olmos being on the show. Bonus freak out if they work, “so say we all” into the episode.